Spaces are limited! Book here Now! The Ontario Association of Certified Home Inspectors (OntarioACHI) maintains a vision to support and grow the sustainability, credibility and health of the profession by protecting the individual professional, promoting their interests and providing unrivalled support to enable members to deliver high-quality Home and Property Inspections across Ontario. To assist our members to prosper in whatever their mode of practice. To raise the profile of the profession so consumers recognise, as important to their decisions to invest in property, the services of our members. To Educate, Mentor, Assess and Certify Home & Property Inspection professionals. To serve as a unified and credible voice to our membership, government and the public in Ontario. To be the resource for industry information and statistics. 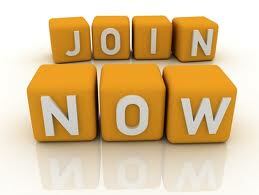 To work with other professions and like-minded associations across Canada to extend our vision. Every successful organisation has to have core pillars to support the vision and mission. We believe that pillars are pointless unless they have a strong foundation and a purpose. We believe it is our members that provide that strong foundation upon which the pillars are based. The pillars provide our members support to purpose our Vision and Mission… that of keeping a roof over everyone’s heads. The Ontario Association of Certified Home Inspectors (OntarioACHI) was founded in 2012, as an independent not-for-profit organisation incorporated in Ontario. Our initial vision was to represent the majority of Home and Property Inspectors across Ontario and serve as the voice and champion of the Home and Property Inspection Profession in Ontario. Over the years since our foundation, through the hard work of our volunteers, OntarioACHI has to a greater extent met that vision. As with all things, growth and strength comes from constantly looking forward and not relying on past achievement. In 2018, we modified our vision and mission statements to look forward to the next six years. Our profession provides a vital and growing support to communities across the province. While the number of Home & Property Inspectors is small, our professionals provide direct support to businesses and consumers with advice that guides them towards property purchases of over $100 billion every year in Ontario. More than ever, in today’s economy, it is important for home and property buyers, home sellers and homeowners to make sure the money they invest in Real Estate is wisely spent. Understanding the condition of the property, they are about to sink hundreds of thousands and possibly millions into, is paramount. Soliciting services and advice from an independent, reputable and professional Home & Property Inspector, that has undergone significant training and assessment and is held to the highest ethical, moral and professional standards, is key to getting that understanding. The Ontario Association of Certified Home Inspectors (OntarioACHI) is the only truly open, transparent and publicly facing Provincial Home Inspectors Association in Ontario. We require our members to work to the highest ethical practices and professional standards. Many of our inspectors, in addition to being highly educated in their field, have completed the voluntary action of providing Police Background checks, proving that they can be trusted with the properties they inspect and the consumers they serve. While we demand high standards from our members, we recognise not everyone learns the same way. This is why we ask our members who are working towards certification to educate themselves the way that best suits them. Whether this is through face-to-face formal college training, online education, self-paced home training or mentored vocational training. The important thing is that they learn what is needed to perform a competent inspection of the highest standards, not how they achieved those skills. We regularly accredit new courses and training methods to ensure we keep up with modern times. We ensure that all of our members, who wish to hold and maintain the Canadian-Certified Home Inspector title and CCHI designation, are assessed individually to identify they meet the required standards. Regardless of where our members obtain their training, they all have to undergo proctored examinations, in a timeframe that is equal to the time it takes to perform a Professional Home Inspection and the pass mark is set high. Where members fall short, we provide assistance to help them identify where their weaknesses are. In addition, all OntarioACHI certified members have to maintain a level of education and professional development which is re-assessed every two years to ensure they are keeping up to date with changes in the profession. Any Inspector in Ontario that registers with us, whether they are a member or not, whether they have achieved a designation or not, all agree to a public profile that can be searched by consumers looking for a competent home inspector. Inspectors that don’t achieve, or fail to maintain the designations can be identified via this search facility. This is one of the ways OntarioACHI and our members strive for transparency to help protect consumers. 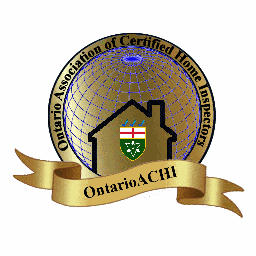 Any Inspector displaying this logo identifies that they are holding themselves out to be a fully paid-up member of the Ontario Association of Certified Home Inspectors, in good standing. This means that he or she has committed to conform at least to the Standards of Practice (SoP) and Code of Ethics (CoE) set out in this website and is accountable to the Disciplinary Processes and procedures of the Ontario Association of Certified Home Inspectors. 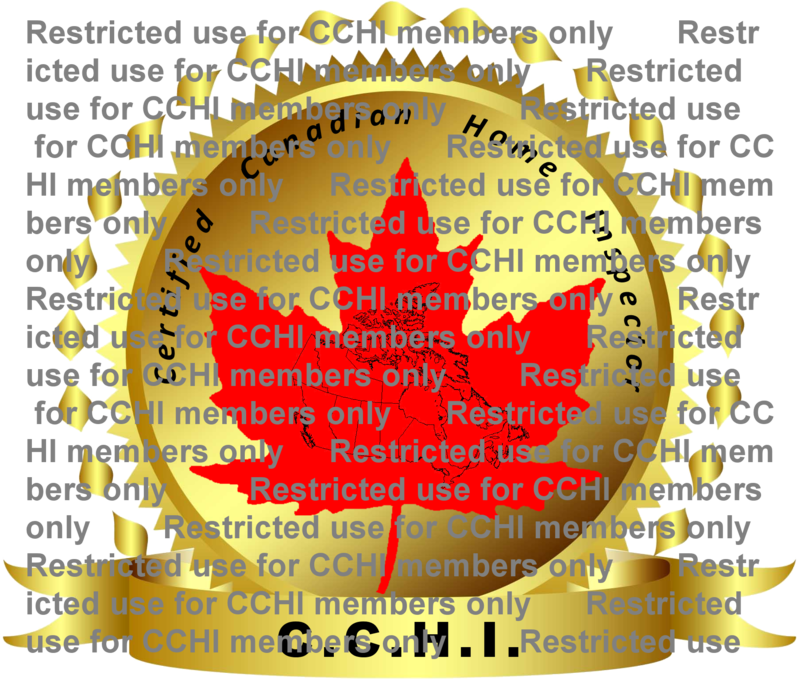 Any Inspector displaying this logo is holding themselves out to be both a fully paid-up member of the Ontario Association of Certified Home Inspectors, in good standing and has also achieved all the educational, skills, insurance and police background check requirements to be recognised as a Canadian-Certified Home Inspector and entitled to use the CCHI designation. In addition to the public being able to check these claims by checking their profile here, each Canadian-Certified Home Inspector is asked to carry a membership card with a QR code that can be read by any smartphone app that will immediately interrogate our database to confirm the inspector’s claims. The Canadian Association of Home & Property Inspectors (CAHPI) have two professional designations they confer to members of the association who have met the appropriate qualifications. Any Inspector claiming to be qualified to this level should be able to provide a certificate, issued by CAHPI that identifies they are entitled to use these titles and designations. This logo identifies that they are holding themselves out to be a fully paid-up member of the Canadian Association of Home & Property Inspectors, in good standing. 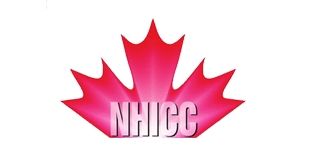 The National Home Inspector Certification Council (NHICC) is a certifying body that does not require membership but exists solely to assess and certify Home Inspectors to a national standard across Canada. Any Inspector claiming to be qualified to this level should be able to provide a certificate, issued by the NHICC that identifies they are entitled to use these titles and designations. This logo identifies that they are holding themselves out to be an Inspector qualified to the National Home Inspector (NHI) standard. The Ontario Association of Home Inspectors (OAHI) offers inspectors a number of membership levels and categories. While those inspectors who have correctly been assessed to use these two designations in Ontario, some confusion exists about the capability to identify a fully qualified inspector using these designations and those that are solely members of the association’s multiple categories. It is important to note the distinction between “Registered Home Inspector” and “R.H.I.” of OAHI and “Registered Home Inspector (RHI)” and “RHI” from CAHPI. The latter two are registered trademarks of CAHPI and define an auditable path to designation for a single membership type and depends upon membership of CAHPI (above) and not OAHI. This logo indicates the Inspector purports to have provided documentary proof they have achieved the Certified Master Inspector requirements standard. The Master Inspector Certification Board, Inc., is not a trade association. Certified Master Inspector® is not a membership level, nor do CMIs belong to any specific trade organization. Certified Master Inspector® is a professional designation available to all qualifying inspectors in the U.S. and Canada. It does not require ongoing re-certification.